The Joy and Lightness of the Angels is integrated within our system. The sound of this bowl leads to contentment and brings a smile to everyone that hears it. Please ask for further stock availability. Supplied with silicone ring and suede wand. As each of these Sound Galaxies crystal singing bowls is unique, the colouration of each bowl will vary from the image. Perfect purity creates high energy. 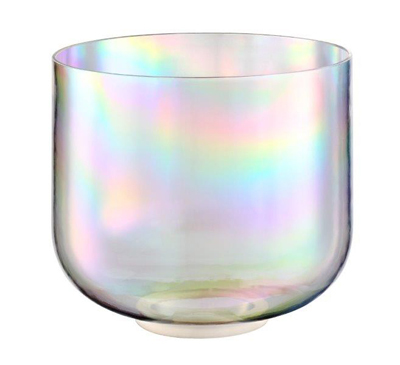 These unique crystal singing bowls consist of the purest 99.998% quartz. The quartz is heated to 2,200 degrees Celsius and bring it to its final form through centrifugation. This pure quartz produces crystal clear sound with a wide range of overtones. A singing bowl of this quality and subtlety can never be mass produced and is always a unique treasure. These bowls are manufactured exclusively in Germany so that we can control the production process at all times. The best materials are selected in order to meet the highest quality requirements. Each of these crystal singing bowls is a unique piece and speaks for itself. Currently available in 18 cm, Note A, Third Eye.